Open Day at Mackie Lane Garden was a huge success: the sun shone, the garden looked fantastic and importantly, we had lots of visitors. Thank you to all the members who worked so tirelessly to make the day happen, and to everyone who visited. 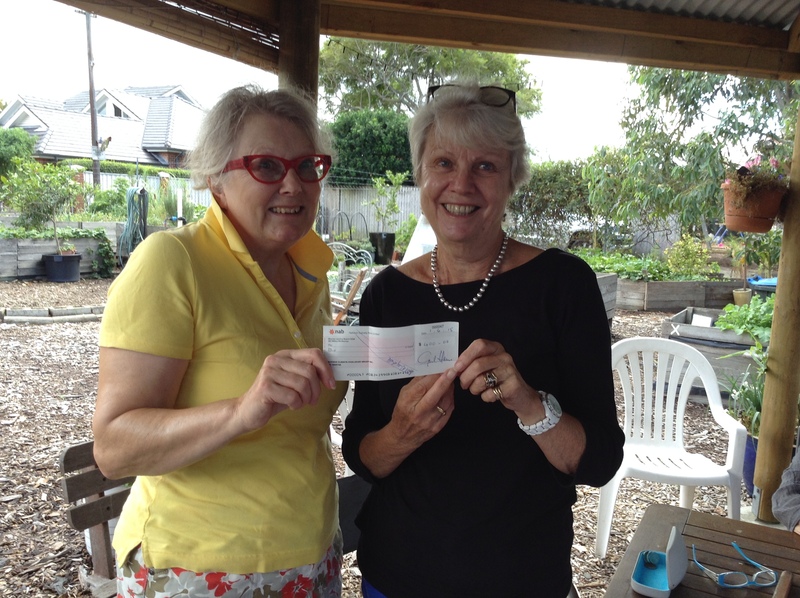 We really appreciate your support and hope we have inspired you to join Mosman Community Gardeners, or at least to have a go at growing veggies at home. There was no organised gardening over Easter at Mackie Lane or Middle Head, but some took the opportunity to tackle a few jobs on the board list and to relax in the shade of the Rotunda or the Middle Head verandah and reflect on our terrific team handiwork over the long hot Summer. In the lead up to Easter some of us enjoyed a fun time at Mackie Lane with a couple of Easter Egg Cover knitting sessions. 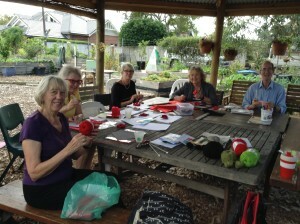 These were led by our multi-skilled, green fingered, knitter extraordinaire president Lilian! Thank you Lilian. We came away saying that we must do this again. The Rotunda is an ideal place for a ‘gather and natter’ session, so if you’d like to invite a group of friends to the Rotunda one morning for a session of your own choosing, please do. This term we have already hosted another series of botanical art classes run by Penny Walton through Mosman Community College. With our highly successful Open Garden Day behind us, we are now tackling the refurbishing and re-planting of beds in preparation for our Autumn and Winter crops. Items on the menu include potatoes, garlic, broad beans, peas, onions and all the brassica family like cabbages and (shall-we-have-yet-another-go at) cauliflowers! If you have a request for a vegetable you would like us to try, please come along and put in an order. The Sunday after Easter is the first Sunday of April when, at MackIe Lane, we down tools at 4:00 pm and have a BYO get together. We just ask people to bring a small plate (hopefully with a vegetable theme) and their own choice of beverage (plus drinking vessel). We share the goodies and then take everything home thereby avoiding any washing up. Please come along. It’s a good chance to catch up with friends and find out what’s going on in the garden if you haven’t been for a while. Come and join our Summer Celebration on Sunday February 28th from 3-6pm. With veggie recipes to sample, guided walks, mini talks, and kids’ activities, there’s fun for all. Everyone is welcome! Behind Honeysuckle Garden Nursery, 500 Military Road, Mosman. Turn into Lang Street, then first left, opposite Surfection, into Mackie Lane. What better way to celebrate Spring than with a twilight BBQ Picnic at Mackie Lane? 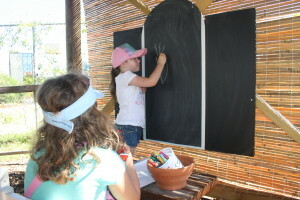 On Saturday 12th September members, family and visitors came along to the garden as part of the Mosman Festival. MCG was asked to participate in this bi-annual event and decided the best way was to expand on our social Sundays. The weather was perfect and we surprised ourselves with the large range of salads we were able to produce on the day. Taking produce from both gardens we assembled and enjoyed, beetroot, celery, leeks, spring onions, multi coloured lettuce, rocket, landcress, radish, red cabbage and, of course, plenty of herbs. We thank Mosman Council for accepting and promoting this event. 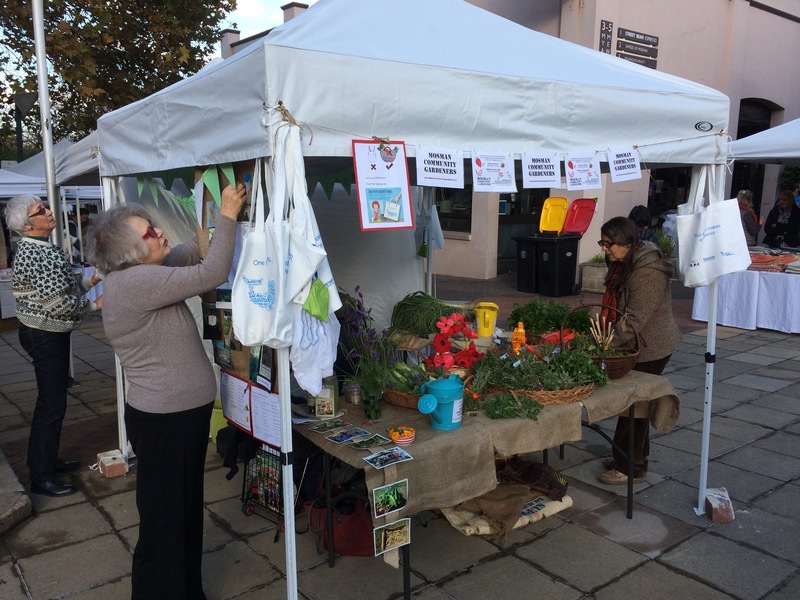 Our two market stall days were a success. 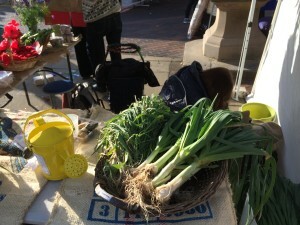 In June and July at the Mosman markets we gave away hundreds of our ‘grandmother’s’ leeks and herbs. We had photos on display and chatted to the very many interested shoppers about the gardens, our plantings and locally grown food. Mosman Council had an initiative on lessening the use of plastic bags and let us give away free bamboo shopping bags and nets for fruit and vegetables at the stall. In July, Gill Harrison kindly made us 3 terrariums which we used in a ‘guess the number of beans’ competition. Thanks to Jill and all other members who helped out on these two days, they were enjoyable events due to the number of people willing to become involved. MCG has been awarded a grant from Mosman Council for our application for a large water tank and solar pump. It is intended to put the tank in the corner abutting Midas, from whose roof we will harvest water. We are hoping to install the tank soon. In our application it was pointed out that rainwater is better for plants, the cost of using piped water will be considerably reduced and, most importantly, we will no longer be using drinking water. MCG continues to supply Mosman Council’s Carers’ café with flowers and foliage each month from both gardens. As the seasons change so does the produce we take along, all of which we are assured is appreciated. Mosman Daily promoted our new solar lighting with an article and Clare got a similar piece and photo in North Shore Living; thank you Clare. This sort of publicity is always important to MCG. Middle Head continues to thrive. If you haven’t visited this garden you should, it is open all the time. As you approach the boom gate at the entrance, turn left and continue along the road. You will see a large building, The Soldiers’ Institute, on the right and the garden is directly in front of this. As well as the garden other NPWS volunteers have spent years clearing the surrounding bush and a walk along the pathways there bring you to an entrancing view. Broad beans, peas, celery, beetroot, kale, silverbeet, radish, lettuce, leeks and landcress are being harvested at Middle Head, with potatoes and garlic doing well and seedlings are ready for summer planting. 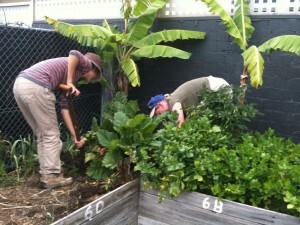 Gardeners at Middle head meet on Tuesdays at 3 p.m. and Sundays at 4p.m. Mackie Lane now has a new wooden fence erected by Honeysuckle Nursery. We elected for the ‘rough’ side as it provides a perfect place for wire to trail climbing plants. We are always complimented on our flowering fence line abutting the lane. Herbs will soon be added to the garden pots along the outside for locals to pick at will. The Rotunda has continued to be a boon to gardeners seeking shade, for yet another Botanical Art Class, for the BBQ and for our social events. The indefatigable Chris Lee connected up some water tanks donated by John & Sandra Nelson from their garden to a pump, a precursor to installing our large water tank. As always there is an abundance of produce at Mackie Lane, being harvested or well on the way. Summer plantings are well in hand, with an emphasis on those we use most frequently. Members are encouraged to nominate plants they enjoy eating to be planted. There will be a Management meeting in October and in November we will again reach yet another AGM. Should you wish to be more involved with the management side of MCG there is chance to do that then. You will hear more about this meeting from Kerry. Our two beautiful gardens couldn’t work without the help and assistance of our members. Whether your visits are sporadic or regular we appreciate your involvement and the wonderful produce to share that is the end result. We acknowledge the continuing support offered to us by Mosman Council and Ausgrid. Mackie Lane has lighting! Chris, ably assisted by Peter and Diana, installed the solar panels at Mackie Lane and our monthly Management Meeting was held there on Wednesday 20th May. Thanks to Mosman Council for the 2014/2015 Grant which made this possible. We will now be able to have lighting for our socials, meetings and other events. The Stop Press News is that plastic screens have been added to the Rotunda, meaning the whole structure is now virtually weatherproof. Please see our guidelines on availability. You can’t have missed the new Plant Nursery being erected between Mackie Lane and Military Road. This is to be Honeysuckle Nursery. Peter Hook, Gill and Chris Lee have been working hard negotiating various aspects of the build which affected our garden, such as new water pipes with a meter, our water being switched off and the building of a concrete platform abutting our adjoining fence which seriously impacted on our run-off from the rain. All the problems have been calmly and efficiently sorted out. We do hope that the opening of the Nursery will bring added interest to the garden. 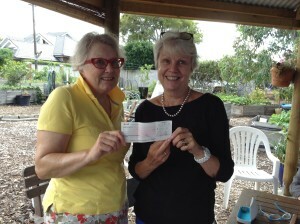 On 1st April Mosman Climate Challenge Group, a long time supporter, disbanded and a donation of $400 was made to MCG. The intention is to spend the money on much needed tools for both gardens. Mackie Lane is full of Autumn/Winter plantings we look forward to harvesting in the coming months. This cooler weather makes it ideal for gardening. We now have a the added bonus of a pump to help out with the watering. In the beautiful surroundings of Middle Head the garden continues to flourish. If you haven’t been there, do pop along, it’s open every day. We were lucky enough to have beds made from old signposts so our beds are labelled Gates Close & Store Beach, although some of the signs have rotted through and need replacing. Mel (National Parks and Wildlife Service) has assured us that there are more available. In April poppy making workshops were held to commemorate this very special Anzac Day and was well attended. We knitted, crocheted and fashioned poppies from felt and the resultant poppies were displayed at Mackie Lane inside our beautiful Rotunda. One of the attendees, Jill Swart, a well-known local artist, gave us photocopies of photos she has of her father and Uncle who both served in WW1, which added a very personal touch to our tribute. Some of our poppies went to Glengarry Twilight Care who formed the poppies into the number 100. Making poppies in the Rotunda! 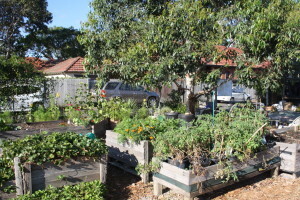 “Mackie Lane Community Garden is a hidden oasis in Mosman bursting with flowers, vegetables and ornamentals giving the artist a rich variety of patterns and textures to work with” is the way Mosman Community College promotes the second Botanical Art classes which run though April and May. Need we say more? On the third Friday every month since July 2014 we find suitable foliage and greenery to take along to Mosman Council’s Carers’ Café. We’ve been assured that the produce we take makes the “whole place smell nice” and invokes pleasant memories. May’s contribution included basil flowers, pineapple sage, native mint, correa, tarragon flowers, cosmos and flowering pak choi, collected from Middle Head and Mackie Lane gardens. Roy McVeigh, one of our members, has recently opened his own restaurant, Dragoncello, in Surry Hills. 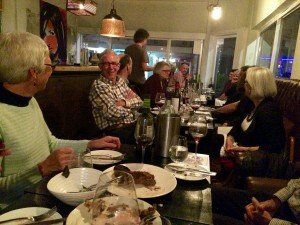 Roy and Esther invited members to a degustation dinner where we were treated to an absolute feast. Roy gleans produce from our gardens for his food, and forages for weeds and conjures up imaginative food and flavours. If you missed out this time, look out for the next invitation. Mosman Council has given us a free stall at Mosman market for June and July; this gives us an excellent opportunity to showcase MCG to the wider community. The first will be on Saturday 6th June from 8 a.m. to 3 p.m. There are working bees at both gardens to get produce ready on the Friday before. Please help out if you can this month, visit the stall or put forward your name for July. 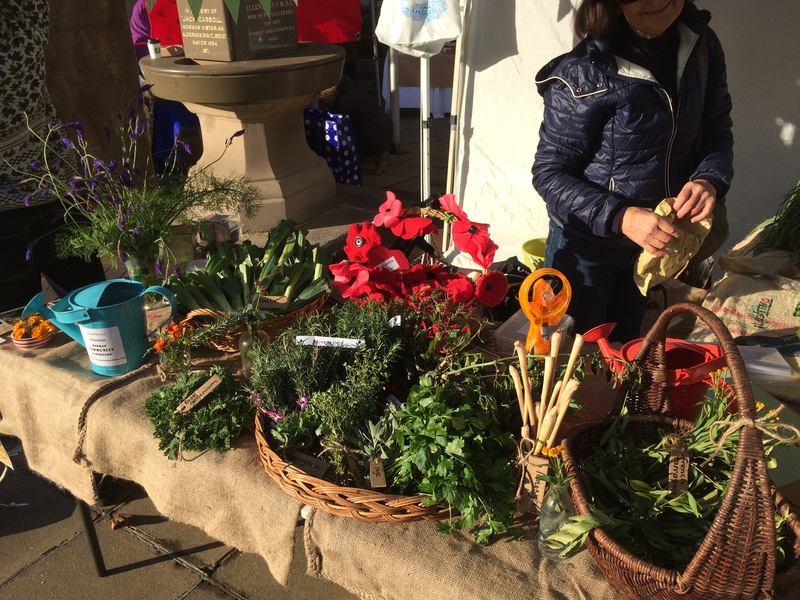 We intend to have leeks and herbs available for samples, photographs, maps of our gardens and our friendly members on hand to advise and chat. As well as the continuing our association with Middle Harbour School, whose lovely scarecrow was battered by the recent storms, we had a visit from our nearby Northern Nursery School. This was such a success that the visits will be repeated and MCG has been invited to view their Community Garden next term. As always, none of this could happen without the dedication of members. We must also thank Mosman Council and Ausgrid for their continued support. It is time for an update on the happenings in and around MCG over the Summer. The Christmas parties seem a long time ago, but the gardens have flourished and produced an abundance of crops for us to share. Annual General Meeting: In November we had an excellent turnout for our AGM, welcomed more new members and celebrated with an excellent dinner at Thai Kanteen. A presentation was made to thank Tina Jackson for her role and contribution as President over the last few years. We have been fortunate in our Committee members who have worked hard to make sure the gardens continue to operate smoothly. 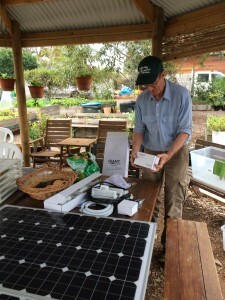 Contacting us: If you wish to contact the Committee please email us at mosmancommunitygardeners@gmail.com However, please be aware that only the Committee can access this account, which is used primarily to send out notices of the MCG monthly Committee meetings and other items it is felt may be of interest. If you wish to pass on relevant and suitable information to the broader MCG membership, you need to ask that a Committee member forward it to the whole group. Mackie Lane: If you haven’t been to Mackie Lane for a while you may be surprised to find the construction on the ‘spare’ land. This is to be Honeysuckle Nursery, formerly located on the other side of Military Road. It will have a plants area between the building and our garden fence, thereby alerting customers to our existence and encouraging them to explore further! Some rerouting of the waterpipes needs to be done, but in case of emergencies we have an excellent source of runoff water from the Rotunda. 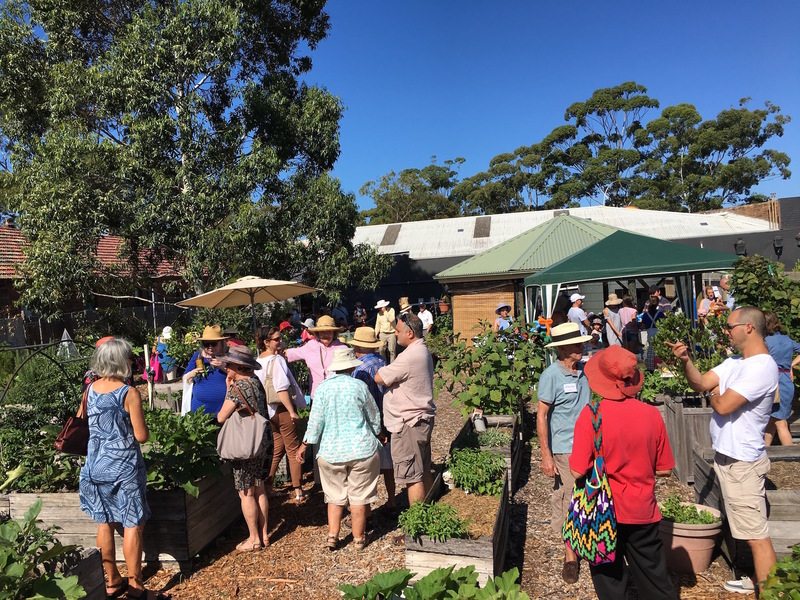 Several new events have taken place recently at Mackie Lane; a botanical Art class on Wednesdays run through the Mosman Evening College, a CEFE Christmas BBQ, and a Council run workshop on “Attracting Birds, Bees and Butterflies to your garden”. MCG is always happy to open the garden to suitable events. Middle Head: the garden continues to thrive in the wonderfully quiet surrounds of the National Park. Summer this year has seen an abundance of zucchini, tomatoes, beans, basil, silverbeet, chillies, cucumbers, carrots & potatoes. If you haven’t yet visited this lovely spot do consider doing so, working bees are Tuesdays and Sundays but the garden is always open. Beauty Point: In late November MCG was invited to Beauty Point School for the opening of “Junior Landcare in the Community” Two years ago, MCG and Mel Tyas from NPWS instigated a project to build a 5 bed school vegetable garden with the help of children and parents from the school. Since the initial well-supported weekend working bee, the garden has been a real success. It is now managed entirely by the school and has expanded to one bed per class, with the teachers enthusing about the garden’s potential to enrich maths, art and science lessons. When children pick off and eat purple king beans raw then find and cut up a cucumber to share, you know they are on the right track. Carer’s Cafe: Once a month we collect flowers, herbs & foliage from the gardens for the Carer’s Café held at the Seniors’ Centre. 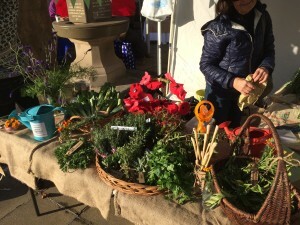 We take whatever is available, such as leek flowers, sprays of lemon verbena, marigolds and potted succulents. We have been told that pleasant memories are evoked and the ‘whole place’ smells good after our visit. Thank you: We are grateful to Ausgrid and Mosman Council for their continued support but MCG couldn’t manage without the involvement of the members. Beyond participation in working bees there are many ‘invisible’ tasks at the gardens such as daily watering, offering to open and close the garden for working bees, the myriad tasks involved in planting and raising seedlings, repairing garden beds etc. Autumn is ideal for collecting those fallen leaves and bringing shredded paper along with your kitchen waste, all essential for the compost. Projects: At the end of each financial year we need to account for our current Mosman Council grant. At the same time, over the last few years we have also successfully applied for new grants. We do need new ideas for projects to put forward for a 2015/16 grant. Naturally, both mean form filling, but for MCG this has resulted in great benefits. For 2014/15 MCG was awarded a grant from Mosman Council for the building of new wicking beds and also to provide solar PVC panels for the Rotunda roof. The latter will enable us to produce and store electricity for lighting so the use of the garden can be extended in Winter and also, possibly enabling us to run small pump watering. There is to be a meeting at Mackie Lane on Sunday 22nd March to discuss the solar project at 5 p.m. after the usual working bee. If you have any interest at all in any aspect of this great addition to Mackie Lane please do come along or let us know of your interest. With the arrival of Autumn we look forward to cooler days and pleasanter working conditions. I’m sure you all feel, like me, the same satisfaction when you catch sight of the gardens again, thinking, “Look at what we have achieved”. 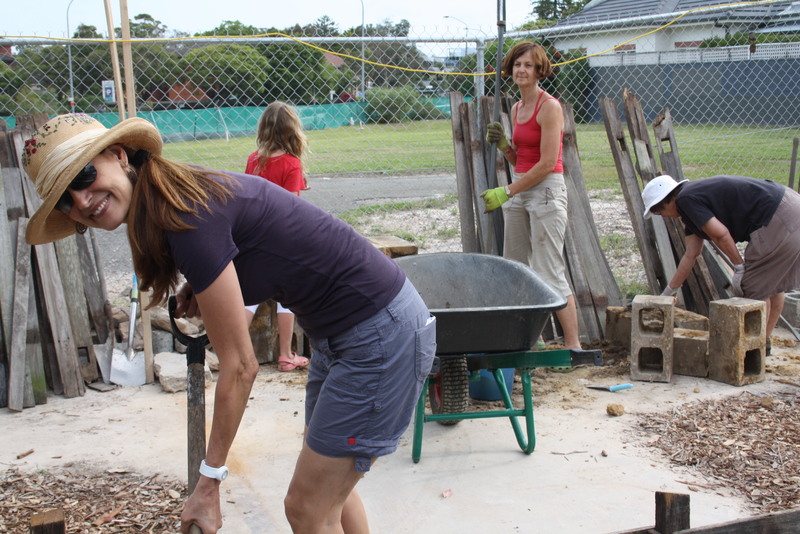 Once again, Mosman Community Gardeners went from strength to strength. The new rotunda at Mackie Lane provided the focus for our education program as well as many celebrations; the gardens at Mackie Lane and Middle Head flourished; our partnerships deepened; and MCG continued its mission to inspire and encourage sustainability, the cultivation of edible plants and sharing of food, and the nurturing of community connections and friendships. For the highlights of 2014 see Tina Jackson’s President’s Report. well as a record number of visitorswho came to be inspired and learn from what we‘re doing at the garden. Mosman Council recently delivered a new load of wood chips and now all the garden walkways are covered. Our children’s program continues with Kids Cottage Middle Harbour children tending and harvesting their dedicated beds and children from nearby Kinderland visiting to learn about edible gardening. Mackie Lane garden is very family friendly with a cubby house, sandpit, bean teepee, blackboard and gardening activities to engage the kids. Students are also volunteering in the garden as part of the Duke of Edinburgh program. The planting committee coordinated by Gill Lee has developed an autumn planting plan and things are well on the way for the new season. For what to grow during autumn see here. Celebrations: On the first Sunday of the month we have a celebration after our gardening hours from 3-5pm. Everyone is welcome. BYO food and drinks. Middle Head update: Planting includes okra, artichokes, tomatoes, kale, mini cabbages, mizuna lettuce, snow peas, shallots, beetroot, carrots, daikon, many different varieties of chillies from mild to very hot and much more. As always, the regular gardeners say that Middle Head garden is a happy place! 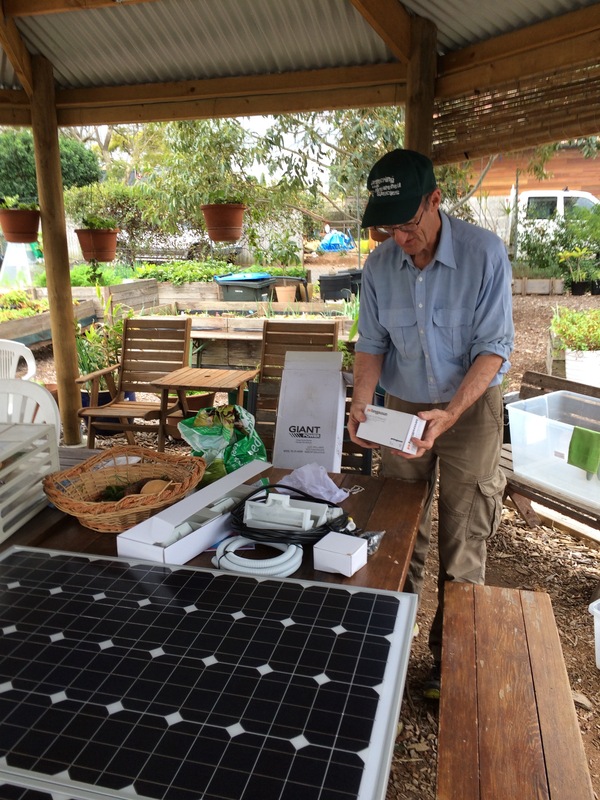 Farewell and thank you: This is my last news update as President of Mosman Community Gardeners. My work commitments have increased this year so I need to step aside, but I’m part of a wonderful team of committed community gardeners, so I know this decision won’t disrupt the ongoing operation of MCG. We have come a long way since our first meetings over four years ago when we had no land and spent most of our time lobbying for a community garden. 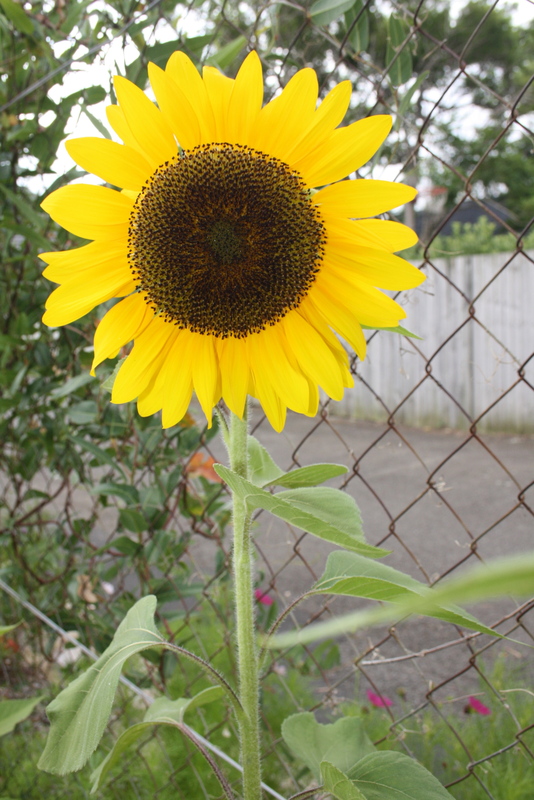 Today we have two thriving gardens, an ever-growing membership, and importantly we have succeeded in bringing the cause of growing edible plants to the attention of the Council and the community. I will continue to be active in MCG and look forward to seeing you in the gardens sometime. My heartfelt thanks to MCG members and everyone who has supported our work over the years. It’s been a very rewarding journey.